UPSC NDA admit Card 2019. Union Public Service Commission has just issued the Admit Card of UPSC National Defence Academy and Naval Academy Exam of 2019. Those Candidates Who had applied for this exam now they can download their Admit card by just reading the details as given below. Step 1- Click on the link as given below. Step 2- Login with your Reg.ID and Password or Date Of Birth. 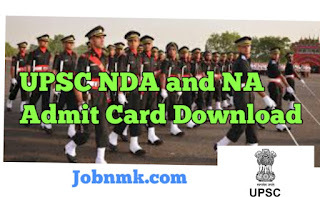 UPSC NDA admit Card 2019. We hope you got proper information about how to download UPSC NDA Hall ticket.